LOS ANGELES -- Ryan Reynolds is the latest superhero to rule the weekend box office. 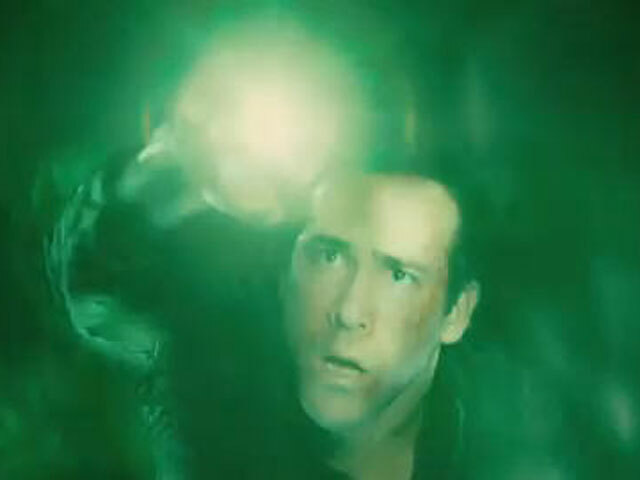 Reynolds' "Green Lantern" debuted at No. 1 with $52.7 million domestically, a fair but unremarkable opening stacked up against other comic-book adaptations. The movie added $17 million in a handful of overseas markets where it has opened, including Britain and Russia. Released by Warner Bros., "Green Lantern" brought up the rear among superhero movies to open so far this summer, behind the $65.7 million debut of "Thor" and the $55.1 million launch of "X-Men: First Class." The previous weekend's top flick, Paramount Pictures' sci-fi adventure "Super 8," slipped to No. 2 with $21.3 million. Its domestic total rose to $72.8 million. Jim Carrey's family comedy "Mr. Popper's Penguins" had a frosty start as the 20th Century Fox release came in at No. 3 with $18.2 million. Overall business cooled for the second-straight weekend. Hollywood revenues totaled $149 million, down a steep 25 percent from the same weekend last year, when Disney's Pixar Animation blockbuster "Toy Story 3" debuted with $110.3 million, according to box-office tracker Hollywood.com. Receipts this summer season still are ahead of last year's, with revenue climbing to $1.56 billion since the first weekend in May, up 7 percent from 2010's pace. Another Pixar animated sequel, "Cars 2," could steer Hollywood upward again this coming weekend. "We're fine. We're still ahead of last summer, and Pixar is going to have a chance to get us back in the mix next weekend," said Hollywood.com analyst Paul Dergarabedian. Adapted from the DC Comics series, "Green Lantern" stars Reynolds as a cocky test pilot who gains superpowers after he becomes the first human recruit of a galactic police force. The movie was trashed by critics, and after a solid $21.6 million haul on opening day Friday, "Green Lantern" trailed off sharply as revenues dropped 22 percent Saturday. That's often a sign that a movie lacks staying power, since revenues for new releases typically rise on Saturday. "The mid-weeks are going to tell the tale of the movie," said Dan Fellman, head of distribution for Warner. If "Green Lantern" does good business come Monday, "then all bets are off and we're back in the game." Likewise, 20th Century Fox is counting on good holdover business for "Mr. Popper's Penguins," a children's book adaptation that stars Carrey as a neglectful dad who learns the value of family ties after he inherits half a dozen pesky penguins. "It's a heartwarming PG comedy that everybody can go see," said Fox distribution executive Bert Livingston. "There's humor for adults in there, and it's got penguins. People love penguins." In narrower release, Freddie Highmore and Emma Roberts' teen romance "The Art of Getting By" flopped with a debut of just $700,000. Released by Fox Searchlight, "The Art of Getting By" played in 610 theaters and averaged a dismal $1,148 a cinema. That compared to a $13,806 average in 3,816 theaters for "Green Lantern" and $5,451 in 3,339 cinemas for "Mr. Popper's Penguins." The Warner Bros. sequel "The Hangover Part II" pulled in $9.6 million domestically and $21.4 million overseas to raise its worldwide total to $488 million. That topped the $468 million global haul of 2009's "The Hangover." Disney's "Pirates of the Caribbean: On Stranger Tides" padded its lead as the biggest worldwide box-office draw released this year. The movie took in $6.2 million domestically and $25.9 million internationally to lift its total to $952.2 million. 1. "Green Lantern," $52.7 million ($17 million international). 2. "Super 8," $21.3 million. 3. "Mr. Popper's Penguins," $18.2 million. 4. "X-Men: First Class," $11.5 million. 5. "The Hangover Part II," $9.6 million ($21.4 million international). 6. "Kung Fu Panda 2," $8.7 million ($52.5 million international). 7. "Bridesmaids," $7.5 million ($7.3 million international). 8. "Pirates of the Caribbean: On Stranger Tides," $6.2 million ($25.9 million international). 9. "Midnight in Paris," $5.2 million. 10. "Judy Moody and the NOT Bummer Summer," $2.2 million.